Emil was born in Jyväskylä, Finland year 1896. He did army in St. Petersburg, Russia, like all Finnish men did on those days. Emil's weight was only 35 kilograms, when he got back home. He was engaged with a Finnish woman called Olga. He went to see her. 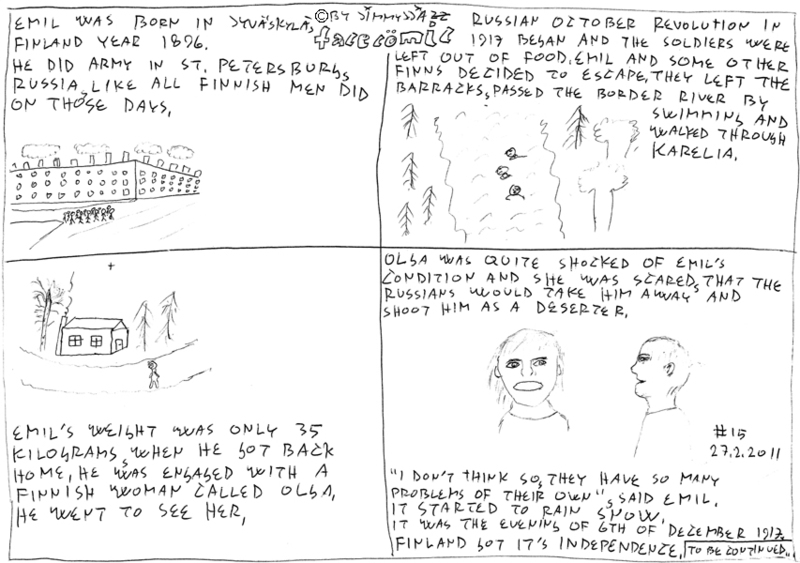 Olga was quite shocked of Emil's condition and she was scared, that the Russians would take him away and shoot him as a deserter. "I don't think so, they have so many problems of their own", said Emil. It started to rain snow. It was the evening of the 6th of December 1917. Finland got it's indepencence.